Friday 6 June 2014 marks the 70th anniversary of Operation Overlord and the invasion of Normandy, now known as D-Day, which saw the Allied forces begin the repelling of Nazi Germany in Europe. To mark the anniversary, those involved, and their children, recall the invasion - from the months of planning on the south coast of Normandy, to the landing on the beaches and the following weeks in northern France and Belgium. On the night of 4-5 June, the wind howled through the pine trees and, as I found my way back to the [meteorological] hut, I realised that the great armada ready to move was at the mercy of the weather. The Invasion forces were put on hold for 24 hours. With a cold front moving south much further than expected over Portsmouth at 21:00, the final decision to go ahead was given at 04:15 on Monday 5 June. Harold and I had been off duty on 5 June. We were in sombre mood as we walked the three miles back up the hill to Southwick village across the bridge. We thought of all the young people who might die on the beaches as daylight approached. Harold Checketts and Jean Checketts (then Jean Farren), the parents of Judith Taylor, met as part of a top-secret team, codenamed Naval Party 1645. Based at Supreme Allied Headquarters, Southwick House, near Portsmouth, the team plotted weather charts for the English Channel in the run up to D-Day. Harold, now 94, was a naval seaman who had spent the previous two years completing meteorological work in the Maldives; Jean had joined the Women's Royal Naval Service in September 1943 and trained in meteorology until February the following year. "They were plotting charts based on weather codes sent from the Air Ministry forecasters at Dunstable," says Judith. "Once they got the codes, their job was to get them on to weather charts, which were eventually presented to Eisenhower, Churchill and Monty." Judith's mother had worked overnight as the Allied forces began to cross the English Channel. "Dad used to greet her off the night shift, sometimes with a cup of cocoa. The night before, all the planes had flown overhead. Dad remembers the invasion was likely to be happening." It was around 08:00, on 6 June, Gen Eisenhower stood outside the small Nissen hut where Harold and Jean worked, at the back of Southwick House, and announced to the troops that the invasion had begun. 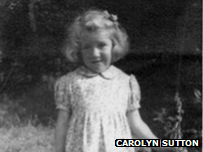 Carolyn Sutton was three years old in early summer 1944, living in Chandlers Ford, near Southampton. "Every road in the area, including the close in which we lived, was filled with tanks and armoured cars. There were American, Canadian and Australian soldiers everywhere. "My parents and our neighbours used to invite them into our homes to have baths and in return were given tins of corned beef and tinned fruit, such luxuries in those austere times! "It was a great surprise to me to wake up one morning to find that overnight they had all gone. 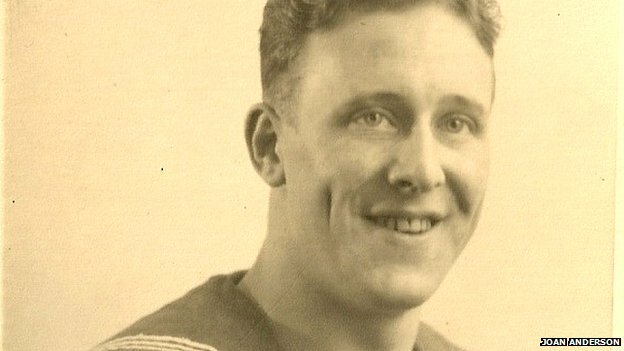 My mother said that all night there had been a continuous rumble as all these vehicles and the troops moved off for the journey across the Channel." 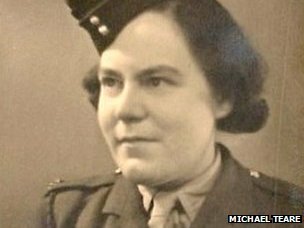 Kathleen Baker, mother of Michael Teare, joined the Auxiliary Territorial Service in 1942 before postings to Strathpeffer, Scotland, and then the Royal Warwickshire Regiment at Budbrook, where she instructed new recruits. "This was in the build-up to D-Day," says Michael. "The Warwickshires were in the first waves on the Normandy beaches." Michael says his mother and others were aware of the magnitude of their preparations but not what their purpose was until somebody shouted: "We've landed in France". Joan Anderson says her father John Ernest Anderson, like many, never spoke much about his role in the War. However, possessing his service record prompted Joan to investigate. April - May, 1944: Gunnery practice, Greenock. 2 June: Leaves with battleship Ramilles and others to join Eastern Task Force. 5 June: One of thousands of vessels waiting off the Isle of Wight. 6 June: Mission to knock out gun batteries at Le Harve. 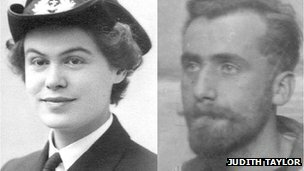 "I knew his ship had been hit by a torpedo," she says. "I did further research at the Imperial War Museum, which confirmed it, and I found the ship's log in a book." 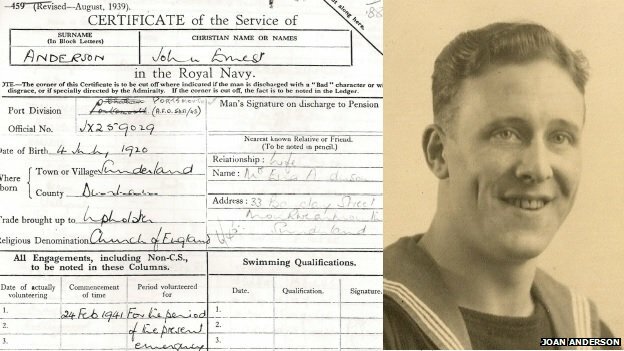 John served as a radar operator on the Warspite, also part of the landings at Sword and the first ship to open fire on D-Day. Its mission was to knock out the German army gun batteries. As Joan discovered, the ship fired 181 rounds of high explosives and 133 round of armour-piercing shells, before returning to Porstmouth to reload. 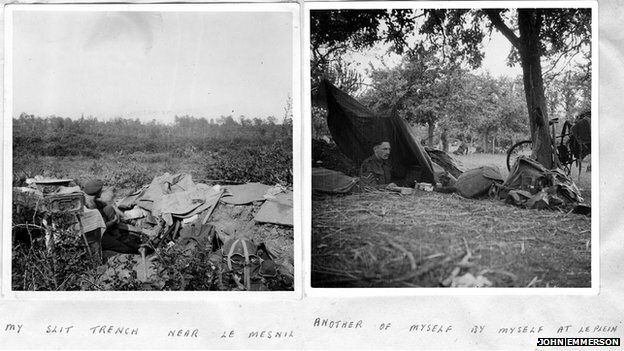 A selection from the photo diary of L/CplJohn Kenneth Emmerson, known as Ken, can be found here. Ken was a commando who went ashore at Sword Beach with Brig Lord Lovat. He was an avid photographer and brought a camera along, notes John Emmerson, his son. From Ken's account, written for a local newspaper: "We hit the beach with a sudden, grating jar. It sounded as though we had hit an underwater obstacle, and then we were heaving and struggling up the ladder on to the deck. "We scrambled down the ramps and into the water. It was up to the waist and cold. "We had one overpowering obsession, and that was to get off the beaches as soon as possible. We tried to run, but our heavy packs, the soft sand and the weight of water in our clothes shackled us. "There was a continuous staccato of rifle and machine-gun fire. There was a burning tank, and I remember wondering dully how so much metal could blaze so fiercely. "I don't think it is possible to find adequate words to describe everything that happened on that beach; it was impossible to notice everything and the multitude of noises were unintelligible."